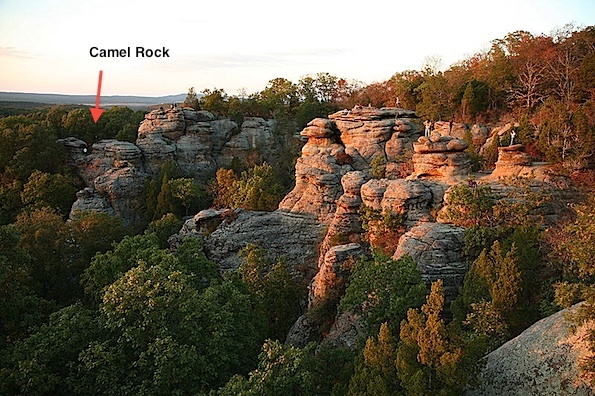 Camel Rock at Garden of the Gods in Shawnee National Forest (Courtesy Daniel Schwen/Wikipedia/Camera Location 37.604349,-88.385578). Pastor Hong K. Yu, 60, of Lake Bluff suffered serious injuries after he fell 25 feet at the Garden of the Gods Tuesday morning. Hong K. Yu was with a small group from the Korean Baptist Church of Waukegan, Illinois for a sightseeing trip at Garden of the Gods. Saline County Central Dispatch received a report of the fall and injuries about 9:40 a.m. Tuesday. Rescuers used a stokes basket to transport Yu from his 25 foot fall near Camel Rock at the Garden of the Gods. Yu was airlifted from the scene to St. Mary’s Hospital in Evansville, Indiana. Garden of the Gods/Shawnee National Forest is located on more than 3,300 acres throughout the counties of Saline, Pope and Hardin in southeastern Illinois near the Illinois-Kentucky border. The nature area includes trails for backpacking and horseback riding, and includes 5.5 miles of interconnecting trails. Rocks along trails are known to become slippery and dangerous when wet.